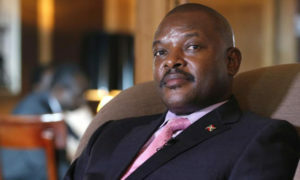 Burundi’s longest-serving president, Pierre Nkurunziza, on Thursday made a surprise announcement that he will not contest in the country’s next presidential elections in 2020. The move follows the promulgation of the country’s new constitution, which was recently approved through a referendum. The amendments extended the presidential term from five to seven years and gave Nkurunziza — whose party gave him the title this year of Supreme Eternal Guide — an opportunity to seek two more terms, beginning in 2020. According to the Electoral Commission, 73 percent of voters backed the changes to the constitution. But critics and rights groups said the referendum campaigning and the vote itself took place in a climate of fear and intimidation. The East African country has been plunged into a serious political crisis since the announcement of Nkurunziza’s controversial candidacy for a third term in April 2015. United Nations human rights investigators last year said they believe Burundi’s top leaders and state security agencies committed crimes against humanity. At least 1,200 have been killed and over 400,000 displaced between April 2015 and May 2017, according to estimates by the International Criminal Court (ICC). Posted by Khalid Al Mouahidi on June 8, 2018. Filed under News. You can follow any responses to this entry through the RSS 2.0. Both comments and pings are currently closed.